Originally classified as a Second Growth, Mouton made some of the greatest red Bordeaux wines ever in the period after the end of the Second World war and was finally upgraded to First Growth in 1973. Every year since the 1940's a different artist has decorated the label. Since the arrival of Philippe Dallhuin in 2003, Mouton has been on fine form. Grapes are now selected only from the core original vineyard site and the wine is always a classic example of both Cabernet Sauvignon and Pauillac. The 2016 Mouton Rothschild bowled me over when I tasted it from barrel. Philippe Dhalluin compares it to the 1986 in terms of intensity of fruit, although there is more maturity and refinement in the tannins apropos of the 2016. Bottled in July 2018, this has an intense bouquet with pixelated black fruit, crushed stone, hints of blue fruit and a touch of India ink. But it is the delineation and focus that take your breath away. The palate is medium-bodied with very supple tannin framing the pure black currant and cassis fruit. The acidity is pitch-perfect, and there is a gentle but insistent grip toward the extraordinarily long finish. Racking my brains to think of another Mouton Rothschild that I have tasted over the last 20 years that was as good as this, I simply cannot come up with one. Drink 2030-2080. The 2016 Mouton Rothschild is a blend of 85% Cabernet Sauvignon, 15% Merlot, 1% Cabernet Franc and 1% Petit Verdot, with the Cabernet Franc and Petit Verdot vinified together. It has a very deep purple-black color and slowly slides out of the glass with spicy notes of Sichuan pepper, cloves and cinnamon stick giving way to a core of perfumed black fruits and florals—blackcurrant cordial, candied violets, blackberry compote, rose hips and black plums—plus suggestions of espresso, damp soil, tar and beef drippings. Medium-bodied, the palate is very firmly structured and jam-packed with latent energy about to burst, offering superbly ripe, grainy tannins and bold freshness to support the intense floral and black fruit layers and finishing very long and very minerally. Powerful, profound wine. Drink 2026-2079. 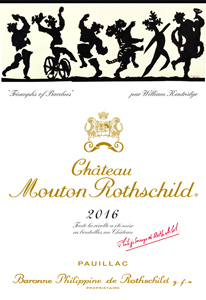 A towering, thrilling wine, the 2016 Mouton Rothschild is unbelievably beautiful today. Aromatics, fruit density and vertical structure all come together. In the glass, the 2016 is remarkably vivid and powerful, and yet a gentler, more feminine side emerges with time in the glass. The intense, mineral, savory profile recalls the 1986, but the 2016 has more grace, inner sweetness and sophistication than that wine. Even so, the 2016 is going to need at least a number of years in bottle before it starts drinking well, although it won't be the bruiser the 1986 remains to this day. This is breathtaking wine from Mouton, Tecnical Director Philippe Dhalluin and his team. Drink 2026 - 2041. On first impression, the 2016 Mouton Rothschild is incredibly reminiscent of the 1986, especially in its aromatics. On the palate, the 2016 naturally reflects the more finessed personality of the year as well as 30 years of continual refinements in vineyard and cellar work. Graphite, grilled herbs, smoke, crème de cassis, bittersweet chocolate and ripe plums are some of the many flavors that flesh out in the glass in an utterly captivating, exquisite Mouton that I had to taste twice and then directly from barrel because of its pure allure. Although it is early, the 2016 Mouton is shaping up to be one of the wines of the vintage. Originally classified as a Second Growth, Mouton made some of the greatest red Bordeaux wines ever in the period after the end of the Second World war and was finally upgraded to First Growth in 1973. Every year since the 1940's a different artist has decorated the label. Since the arrival of Philippe Dallhuin in 2003, Mouton has been on fine form. Grapes are now selected only from the core original vineyard site and the wine is always a classic example of both Cabernet Sauvignon and Pauillac. 83% Cabernet Sauvignon, 15% Merlot, 1% Cabernet France and 1% Petit Verdot in 2016. The Grand Vin will represent 53% of total production this year. A huge, dense, expressive nose here. Layers of black fruits, liquorice, vanilla, pepper, tar and anise. The palate has great intensity of fruit - blackcurrant, kirsch, black cherries - all framed by greatly refined, ripe tannins adding great denisty. This is power and finesse combined, with velvet texture, complex chocolate, black fruit and exotic spice all adding to the harmony. This is a magnificent wine, displaying all the best attributes of the vintage - power, lift, intensity and freshness. Great precision and classic Mouton exoticism. One of the very best wines in 2016. Along with the Château Lafite, the 2016 Château Mouton Rothschild is the wine of the vintage from the Médoc and is a truly profound, magical, blockbuster wine in every sense. It’s based on 83% Cabernet Sauvignon, 15% Merlot, and the rest Cabernet Franc and Petit Verdot, raised in new French oak. Boasting a saturated purple color as well as an extraordinary bouquet of thick black fruits, lead pencil shavings, new saddle leather, and burning embers, with just a hint of its oak upbringing, this beauty hits the palate with a mammoth amount of fruit and texture yet stays fresh, pure, and light on its feet, with a thrilling sense of minerality as well as building tannins on the finish. It’s one of the most profound young wines I’ve ever tasted, and while it will probably keep for three-quarters of a decade, it offers pleasure even today. Bravo! Drink 2023-2098. For the 2016 vintage, Philippe Dhalluin and his team have wrought a big, rich Mouton full of seductive grilled coffee bean, slate, graphite, tight cassis and bilberry. This has depth and impact and closely approaches the 2010. Astonishing! Clearly powerful but with the beauty and flourish of Mouton. It is a long lasting wine, just stretching out endlessly in front of you. The tannins are ever present and precise with a sweetness to them and a satin edge. This is 100% new oak, but has that 2016 trick of seeming perfectly integrated already. A wine to age then sink into on some happy future date. 83% Cabernet Sauvignon, 15% Merlot, 1% Cabernet Franc and 1% Petit Verdot (the last two were co-vinified, unusually).